Inge Hinterwaldner’s Parallel Lines as Tools for Making Turbulence Visible (Representations 124) has won the 2104 Schachterle Essay Prize from the Society for Literature, Science, and the Arts (SLSA). The Schachterle Prize is awarded annually by the SLSA in recognition of the best new essay on literature and science written in English by a nontenured scholar. In many humanities disciplines, the past twenty years or so have witnessed a dramatic expansion in the types of objects and ideas that can be meaningfully invoked in the course of historical study. One consequence of this has been a new reveling in the allure of objets trouvés or historical micronarratives – the conversion of the obscurity, strangeness, and distance of historical debris into a form of rhetoric, which frequently acts as a substitute for more conventional forms of argument or exposition. 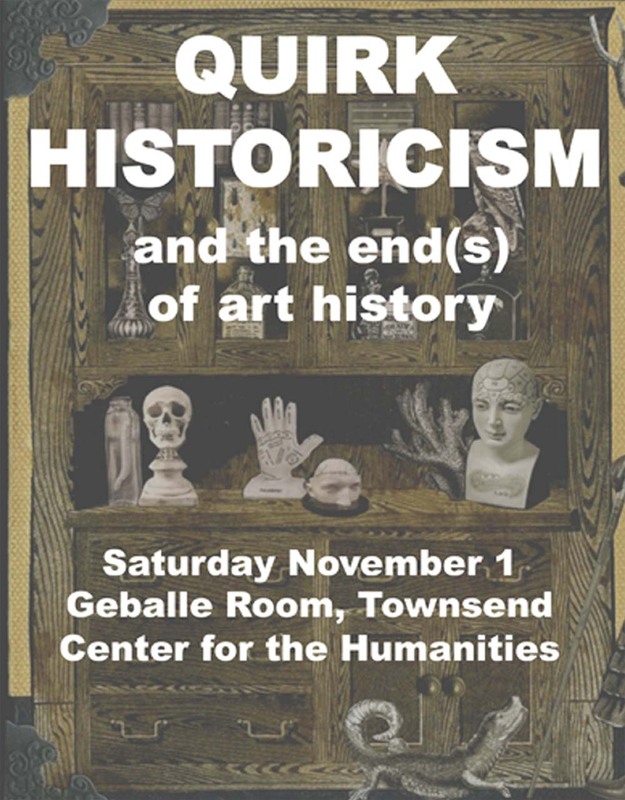 The emergence of this tendency, which we’re calling Quirk Historicism, is thus partly a story about how historical study has been turned into a kind of aesthetic experience. Participants include Nicholas Mathew, Mary Ann Smart, James Davies, Emily Dolan, Deirdre Loughridge, James Currie, Benjamin Piekut, Aoife Monks, Ellen Lockhart, Benjamin Walton, Thomas Laqueur, and Alan Tansman. 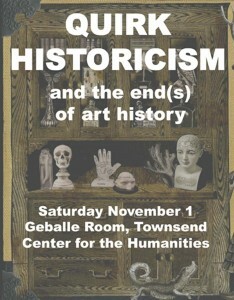 To find out more, visit the conference website at http://quirkhistoricism.wordpress.com. 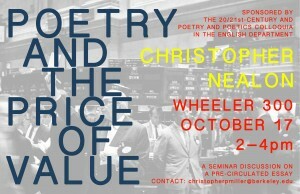 On Friday, October 17, the UC Berkeley English department colloquia on 20th/21st-Century Literature and Poetry and Poetics present a conversation with Christopher Nealon, professor of English at Johns Hopkins University. 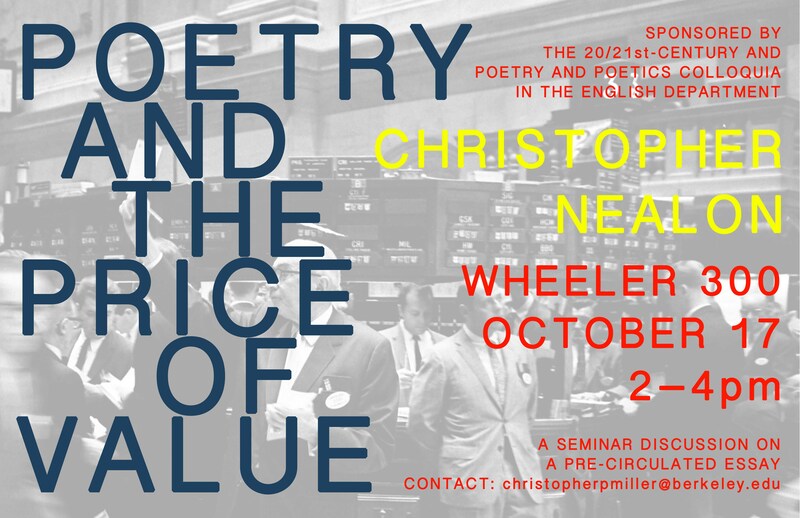 The conversation will be based around a pre-circulated paper, “Poetry and the Price of Value.” The event will take place at UC Berkeley in Wheeler Hall 300, at 2pm. Christopher Nealon’s essay, “Reading on the Left,” is available in Representations 108 (Fall 2009). 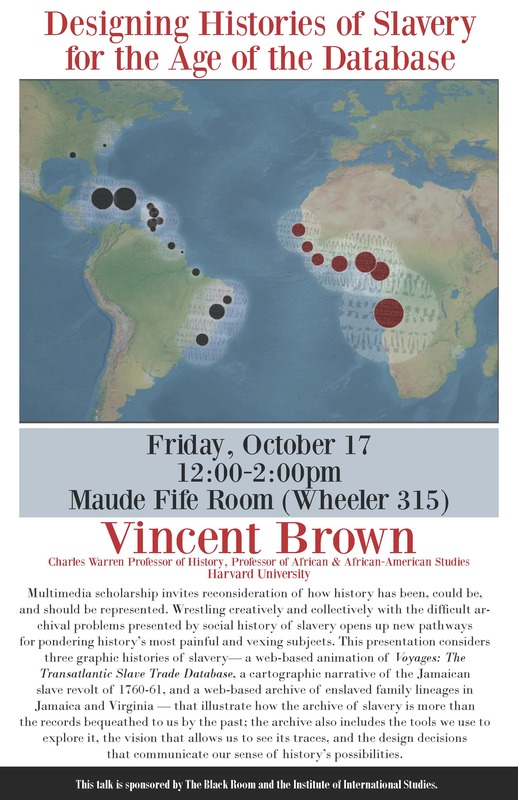 On Friday, October 17, The Black Room and the Institute of International Studies will co-sponsor a talk by Vincent Brown, Charles Warren Professor of History and Professor of African & African-American Studies and the Director of the History Design Studio at Harvard University. This presentation considers three graphic histories of slavery—a web-based animation of Voyages: The Transatlantic Slave Trade Database, a cartographic narrative of the Jamaican slave revolt of 1760–61, and a web-based archive of enslaved family lineages in Jamaica and Virginia—that illustrate how the archive of slavery is more than the records bequeathed to us by the past; the archive also includes the tools we use to explore it, the vision that allows us to see its traces, and the design decisions that communicate our sense of history’s possibilities. 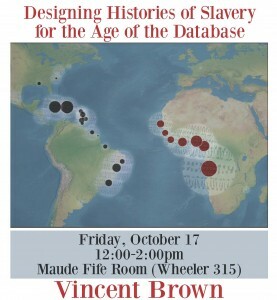 The event will take place at UC Berkeley in the Maude Fife Room (Wheeler Hall 315) at noon.